Note: I have several articles on sharpening different types of bits for a hand brace. While I cover sharpening gimlet bits in this article, I also have articles on sharpening spiral auger bits and center bits as well. Keeping on the brace bit sharpening theme, today I’m going to talk about gimlet bits. These are another style of bit that, like the center bits discussed previously, are quite underrated. Brace gimlets came in a range of sizes from the tiny little #2 (1/16″) up to #12 (3/8″). These bits are typically stamped on their square tapered shank with a number that denotes their size in 32nds of an inch. So a #4 gimlet bit is 4/32 or 1/8″. Gimlet bits typically came in sizes #2 through #12, the numbers representing the size of the bit in 32nds of an inch. This set consists of sizes #2 (there are two #2s in this set just in case, because the #2 sized bit is quite fragile) through #10, and #12. Gimlet bits are typically used for boring pilot holes and clearance holes for nails and screws. But they are also quite useful in their larger sizes (I don’t know of many nails and screws requiring a 3/8″ pilot hole) for boring through holes and holes for dowels & pegs. In my opinion, these bits outperform modern twist bits for these tasks, because, where a twist bit will break out on exiting the wood, the gimlet leaves a clean exit hole because its natural tendency is to pull the chips up into the hole, not force them outward. In addition, while the twist bit cuts with its tip, opening the hole rapidly (risking chipping at the surface), the tapered gimlet cuts with its leading edge when sharpened properly, opening the hole gradually as it progresses. 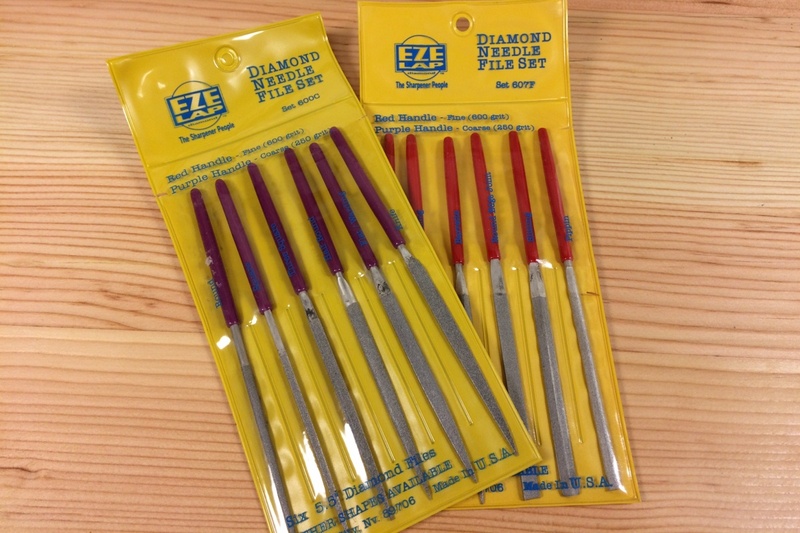 Diamond needle files are really useful for sharpening small tools like gimlet bits, but regular tool steel needle files will work as well. I have coarse and fine needle files for reshaping and final honing tasks. Some old texts would have you believe that these bits cannot be sharpened. However, this is not the case. 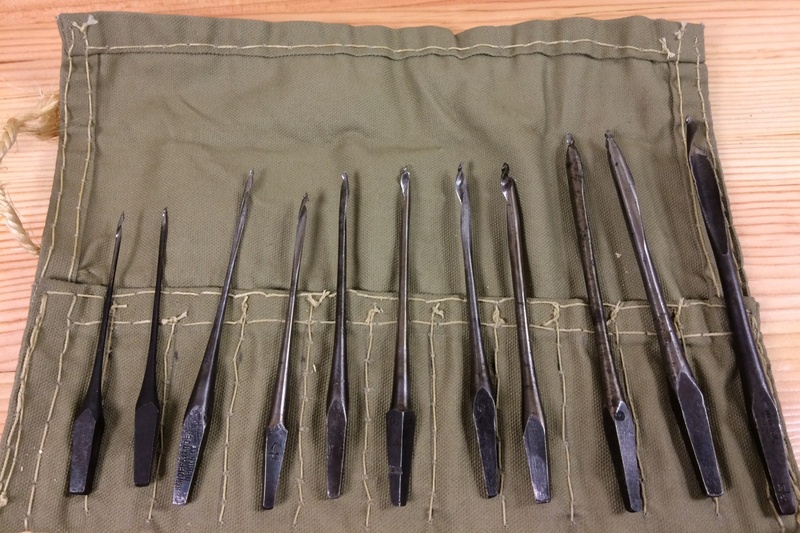 Sharpening them does require some very small needle files, and a bit of patience, but the bits can, and should be sharpened. Once sharp, they perform much better than they do in their typical as found condition. Only the leading edge needs to be sharpened. Just like all of the other bits discussed so far, the outside surfaces of the bit should not be filed. The good news is that only one edge of the bits needs to be sharpened because only one edge of the bit actually does any cutting. If it’s not obvious to you which edge needs to be sharpened, use the bit. As you rotate the bit, you’ll see which edge of the spiral should be cutting. This leading edge is the only one that needs sharpening. 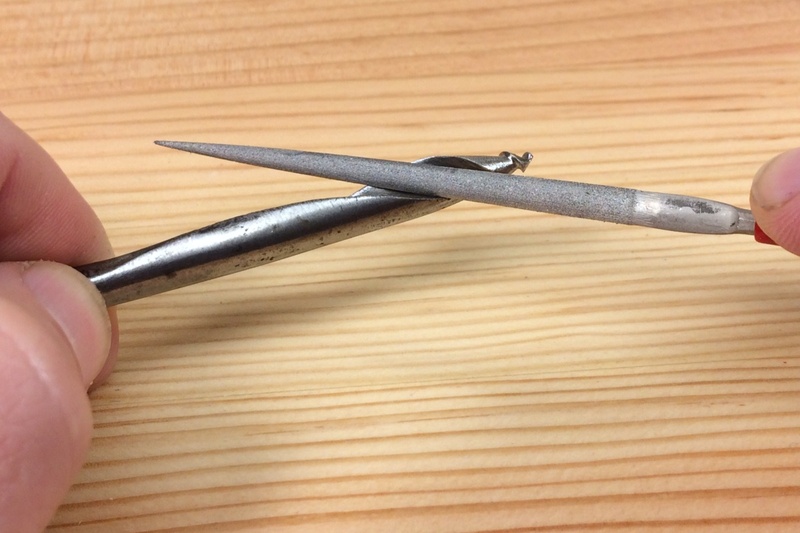 The easiest way that I’ve found to accomplish this is to file the leading cutting edge with a needle file, filing from the tip toward the shank. The bit only needs to be sharpened from its tip up to it’s widest diameter as everything after that will never touch the wood. Just work your way around the flute, filing the inside of the cutting edge. Just like with the other bits discussed so far, file only the inside edge of the flute of the bit. You want to try and avoid removing any significant amount of metal from the outside of the bit so that you don’t change the diameter of the bit. However, with the gimlet bit, this is less of an issue than it is with other bits I’ve discussed here because the bit is tapered. So changing the diameter of the bit just means it will make a smaller hole, but binding won’t be an issue like it would be with some of the other bits. Posted in Boring Tools, Sharpening, Skills, Tools and tagged gimlet bits.